This season did NOT start off auspiciously for Volley Moon's. Opening night, they went 0-2. This start might be the [cherry] pits for any other team- but not Volley Moon's. They may have muttered "fudge" or "nuts", but they never let their spirits melt. Over the following weeks, Volley Moon's sampled their competition and things really began to churn! Soon, Volley Moon's were dishing out losses to the competition and to no one's surprise, they found themselves in the title match. Had you arrived at the gym on sunda[e], you would have been late... or early... and missed the just desserts Volley Moon's was serving up. We saw tremendous play on both sides of the net - scoop after scoop, superman saves, plays that made spectators go bananas! Despite the competitive atmosphere, players emanated the Underdog spirit - no one was chilly or delivering unsportsmanlike [freezer] burns across the net. When the chips fell, Volley Moon's had earned the "Champs" title! The cherry to top off a season they described as "victorious", "cinnamon", a "rocky road", and ultimately a "gold ribbon". 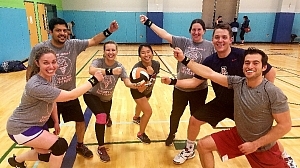 No stranger to Underdog's volleyball scene, this is their third championship in as many years. Memorable moments from this season encapsulate Volley Moon's perseverance: everyone getting sick and the building flood. Volley Moon's are open to sponsorship.